While there are many escapes in the area, nothing takes you further out of your element than the T-Rex café. A visit to this restaurant is almost like taking a quick visit to Disneyland without all of the annoying air travel or expensive road trip gas bills. Of course, unlike Disneyland, the parking is close by and free – and you don’t have to wait for the fun. We went on a recent bustling Saturday afternoon, walked right in and sat down in the middle of a Triceratops. Yes, that’s right, we ate in a Triceratops with hot lava spewing down the wall behind us and giant lady bugs crawling over the balcony above. If that doesn’t actually sound appetizing to you, don’t worry, it’s not really about the food. It’s more about the experience of seeing all these animated, life-sized dinosaurs which really are pretty cool. 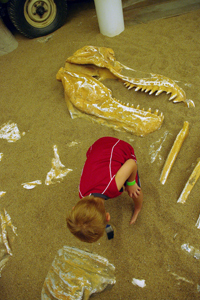 The restaurant itself is an attraction, with a gift shop and a Paleo Zone that allows kids to pretend they are paleontologists digging up dinosaur bones and exploring a cave with ancient geode crystals. There is a “catastrophic comet” event every hour that is loud and crashy - as you would have expected a comet landing to have been for the dinosaurs. Computer interactive screens provide the educational piece explaining how the crystals and fossils formed. My kids had a lot of fun just walking around the restaurant looking at all of the dinosaurs. After dinner, the Legends offers a variety of other entertainment and shopping options. We enjoyed walking down the avenue where outdoor music, fountains and statues showcase Kansas history-making “legends.” There are murals that feature artists like Gordon Parks. The state reptile is presented as a larger than life statue of a box turtle. The state song is a colorful panel with deer and buffalo. Eisenhower’s five stars give a nod to the president’s military accomplishments, and throughout the plaza there are large medallions recognizing the marks made on the world by other famous Kansans. Overall, even though I DO think it’s funny that you can leave your car in the “Gordon Parks” part of the parking area, the amount of unique Kansas history added to the shopping area here is really fun. While there are no rides, the whole thing is sort of like the Kansas-Disney experience – apologies to the Mouse. There is even a scavenger hunt you can print off before you go to make a trip there more of an event for the family. One more note: if you are looking for a whole weekend adventure, this Kansas City spot is a great option. There is certainly enough to fill your time for a couple of days. Several unique hotels in the area, such as the Great Wolf Lodge are specifically aimed at families. There are some great restaurants. One of the new state-owned casinos is just across the street. Nearby you will also find, a new outdoor water park called Schlitterbahn, as well as the Kansas Speedway, a minor-league baseball stadium and a new soccer stadium.There is a LOT going on at the legends – the phrase “something for everyone” is more than a cliché here. What&apos;s your favorite part of The Legends?